Pirates Milky Way Soap Mold features a grimacing pirate with an eyepatch and a dagger between his teeth. 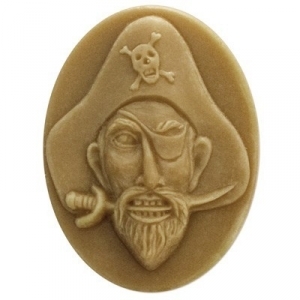 With this mold you can make soaps perfect for a pirate-themed party or anyone with an adventurous spirit! Soap Bar Dimensions: 3.25" x 2.25" x 1.25"
Notify me when Pirates Soap Mold is in stock.